As I followed the sad and disturbing news reports on how Ezekiel Guti Jnr died after he was involved in a freak swimming pool accident in Johannesburg, South Africa, I once again quietly questioned whether God exists and confronted the authenticity of claims that Archbishop Ezekiel Guti, founder of the Zimbabwe Assemblies of God Africa (ZAOGA) church, has special healing powers. How could Guti Jnr spend his lifetime unable to walk while his father supposedly performed medical miracles for everyone else? Perhaps this explains why Guti Jnr vented his frustrations in an interview with the media. He said: "I used to pray to God that even if I cannot walk, at least I should be able to talk. I have seen my parents praying for people who could not talk and they began to talk." But Guti Jnr never did walk. So I can appreciate how fake prophets, fake evangelists and fake healing sessions con faithfully desperate souls. And I understand why religion is losing credibility and popularity to fresh discoveries in the field of medical science: God is always missing when a physiologically tangible miracle is keenly required. God is always AWOL when sacrilegious relationships between men of the cloth and politicians promote deception and profit. God is so silent when self-serving civil leaders make a beeline to church and such publicity stunts become front page news. So I understand why there is an embarrassing proliferation of false prophets and capitalist churches: God has no voice and no real say in biological ills, corruption, the high cost of living, low foreign exchange reserves and increasing impoverishment. God cannot eliminate electoral fraud and stop the government from trampling on the rights of protesters in Bulawayo, Masvingo and Mutare. So while the cultivated picture of the First Family singing in a Sunday Mass at the Methodist Church in Mabelreign might inspire words of praise from gullible followers, it also shines the spotlight on the role of religion in civil affairs. 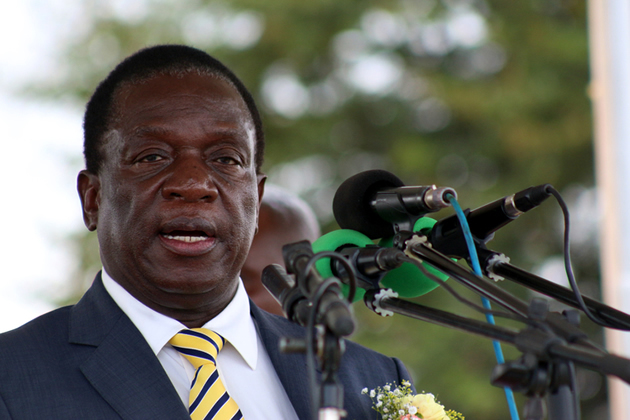 But it is not just President Emmerson Mnangagwa and First Lady Auxilia Mnangagwa who have cashed in on this righteous Christian spirit and endeared themselves with the Lord and millions of his followers in Zimbabwe, Vice-President Constantine Chiwenga on December 24 made an appearance at the Noah Taguta shrine in Marange Communal lands in Manicaland. And before Mnangagwa received the rich blessings of the Lord and made it to the State House through a de facto coup, Grace Mugabe held a massive church rally at Rufaro Stadium on November 5, 2017, that allegedly confirmed that she was the chosen one. Dressed in angelic white and surrounded by thousands of faithful followers, ‘Gucci Grace' exposed how organised religion has become a nefarious conduit for cultivating a clean and God-fearing professional look while simultaneously amassing questionable power and wealth. Worryingly, all the main actors in this seemingly ungodly order of things, the former First Lady, Mnangagwa, Vice-President Kembo Mohadi and Prophet Shepherd Bushiri, seem to have more money and social scandals at hand than they can conceivably handle in one million lifetimes. But how can the Lord allow such godless enrichment and widespread lawlessness to fester and seemingly forgive these prominent figures for their public sins? I have not heard Mnangagwa say a prayer for the victims of the Gukurahundi massacres yet. And when I think about the 1999 murder of Lutheran World Federation employee Strover Mutonhori, I am moved to question everything about God that I have ever believed in. Mutonhori died after an alleged affair with Mrs Tambudzai Mohadi came to light. Unsurprisingly, the Mutonhori family have seen little joy in their efforts to have the police investigate the chief suspect: Vice-President Mohadi. Where is the Lord when Mutonhori dies a cruel and unsolved death and Mr Mohadi becomes a Vice-President 19 years later? And is there a chance that Vice-President Mohadi, who has been photographed in church occasionally, ever prays for the wife and family of the late church worker? Is God watching over this distressed family and helping the mother with money for food, school fees, medicine and transportation? I also wonder if Prophet Bushiri of the Enlightened Christian Gathering Church (ECG ministries), the man who supposedly predicted how Mr Mohadi would ascend to the second highest office in the land, lends the needy all the help he can, especially after churchgoers paid R25 000 to sit next to Prophet Bushiri at a dinner function held at the Pretoria Showgrounds on December 23, 2017. If that ridiculous cost hardly astounds you, the R1.6 million Maserati Levante that the Malawi-born prophet bought his 4-year-old daughter as a birthday present last year should. However, it is the economic and political hypocrisy that formal religion pushes that has wounded the soul of modern society. If Christianity had somehow evolved with no financial and humanitarian terms and conditions attached, all would probably be well. But the price of religion is controlled economic chaos, social inaction and suppressed political disapproval. People expect miracles to happen but ignore how science can help achieve physical goals. Greater practicality and less reliance on prayer could help people enjoy richer and healthier lives and live longer. And although people can seek forgiveness from God and traditional gods for a range of social, economic and political transgressions, bygones cannot be bygones in all fairness: the spirit of the law must always prevail where innocent lives have been lost at the hands of government forces and public funds have been abused or stolen. Because nobody deserves to die or suffer ceaseless emotional and physical anguish for the selfish inclinations of mortal men and the electoral goals of unprincipled organisations. So until God acts on the economic and social tribulations people face on a daily basis and takes a strong and vocal stand on important political matters, scientific and technological realities and not endless and exorbitant faith in religion, should guide us in life.